Lindsay teaches courses in interpersonal skills for leadership and leadership theory and is the co-coordinator for the leadership and entrepreneurship minor. Lindsay's programmatic focus is on Nebraska Human Resources Institute, a leadership development organization that pairs outstanding college student leaders with outstanding K-12 student leaders in one-to-one leadership mentoring relationships. Dr. Lindsay Hastings serves as the Clifton Professor in Mentoring Research and the Director of Nebraska Human Resources Institute, a leadership development organization at the University of Nebraska – Lincoln that pairs outstanding college student leaders with outstanding K – 12 student leaders in one-to-one leadership mentoring relationships. Her research interests include generative leadership and social responsibility, examining what factors influence a leader's ability to promote and establish the well-being of future generations. Hastings' most recent research examined generativity in college student leaders as a result of engaging in a mentoring relationship, which received the 2012 Dr. Ron Joekel Research Award. 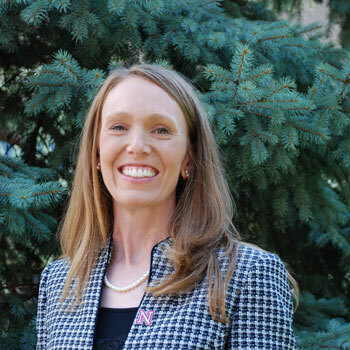 Dr. Lindsay Hastings serves as the Clifton Professor in Mentoring Research and the Director of Nebraska Human Resources Institute, a leadership development organization at the University of Nebraska - Lincoln. Hastings is a three-time graduate of the University of Nebraska-Lincoln (B.S. Secondary Math Education, 2004; M.S. Leadership Education, 2007; Ph.D. Education Leadership in Higher Education, 2012). She is a resident of Seward, Nebraska, where she lives with her husband, Matt, and two daughters, Lilly and Anna.